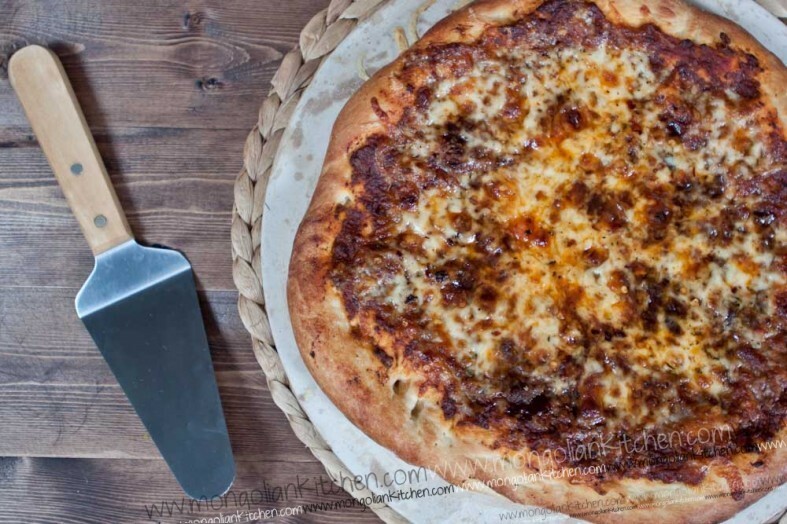 This delicious looking Pizza we tend to make with the leftovers of our bolognese sauce recipe. There is almost always some left and we always try to find ways to use leftover food. 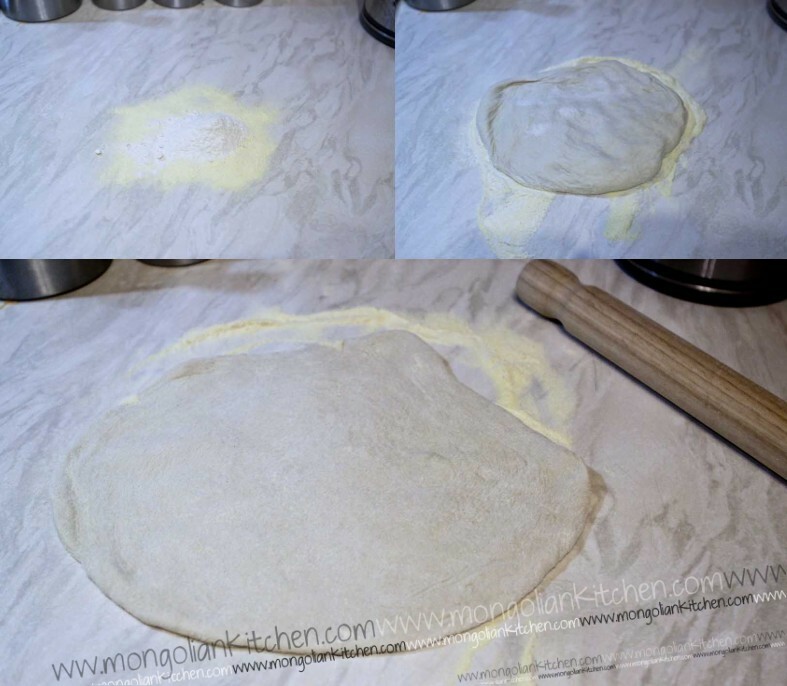 We use our home-made pizza dough which is then rolled out in a mixture of corn and plain flour. 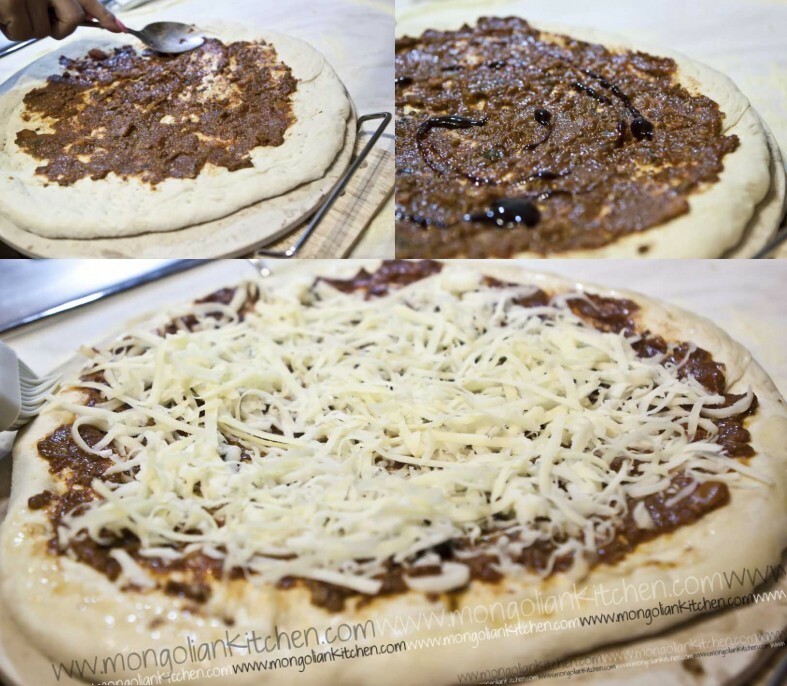 We then simply use the bolognese sauce to lightly top the pizza and sprinkle with mozzarella cheese…you cant really get a simpler recipe. 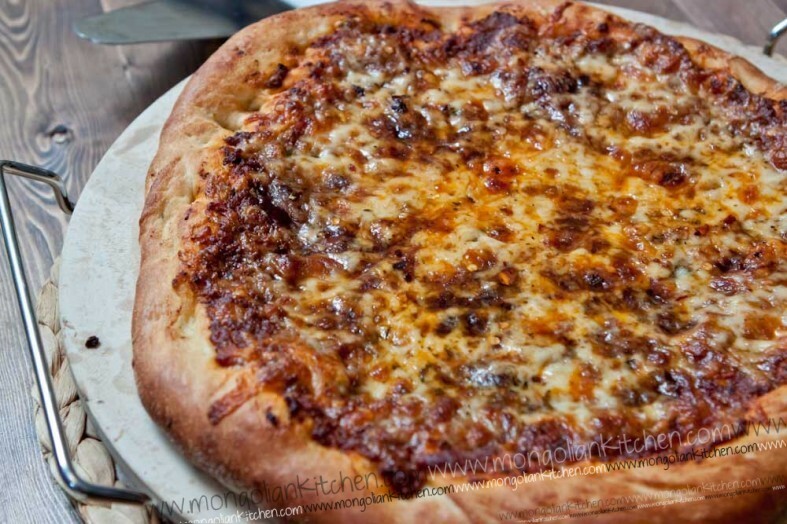 The beauty of this pizza is all the oils in the bolognese float on top of the cheese. You might think that looks greasy and disgusting but the oils are where the flavour is anyway! To get an even better pizza make sure you bake it on a pre-heated pizza stone (simplye put the stone in a high oven for 20 minutes then assemble the pizza on top and stick back in the oven). For a final added indulgence and also to cut through the bolognese. We decided to add a drizzle of BBQ sauce which adds a smokey sweetness to cut through the rich bolognese. Add 2 cups of flour, oil and salt and mix with a wooden spoon. At this stage the mixture is quite runny and sticky. Switch on the stand mixer with a dough hook and allow it to mix the dough..you will see the gluten begin to stretch in the dough. Do this for 5 minutes until well combined and smooth. Slowly add the rest of the flour, ½ a cup at a time and continue to mix for 2-3 minutes until you have a pizza dough looking ball. When ready divide into 2 dough balls, cover with tea towels, top with flour so as not to stick. 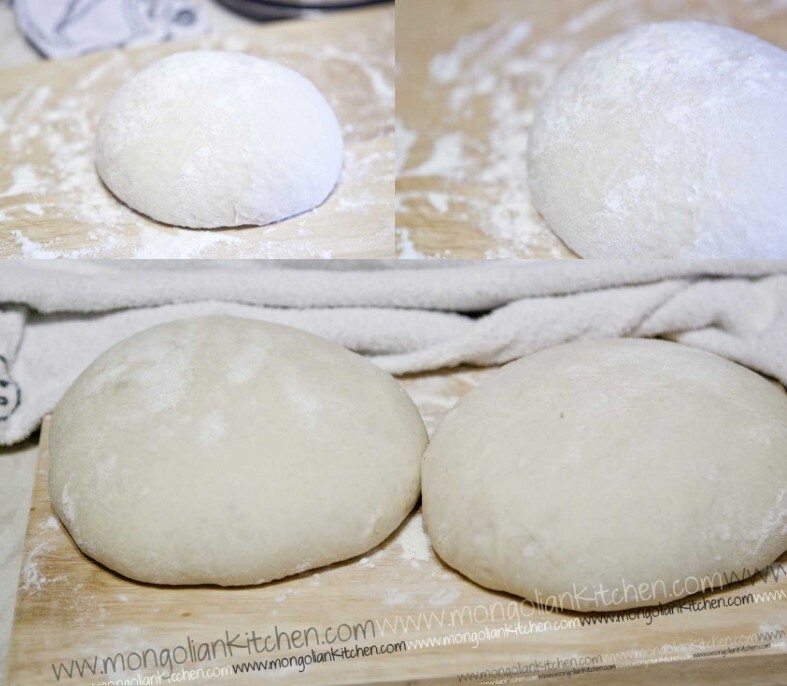 Cut the dough into 2 balls and place on top of the flours. Using 2 hands, press down with the outer edges of your hand to create a slight crust. At this stage you may still find your pizza has bubbles due to the yeast. use a fork to "prod" the base all over so that it doesn't continue to rise and bubble. 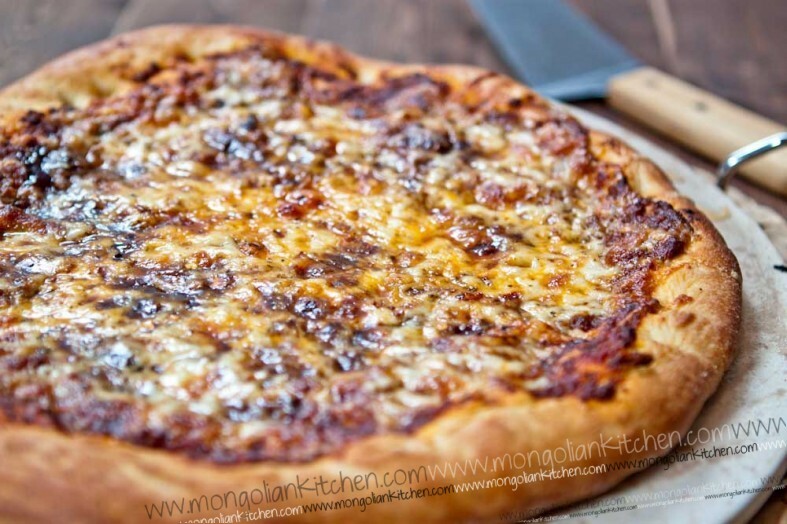 Thank you for your comments, try our pizza recipes and let us know how you get on.